01.13.2004 - This was a very interesting job. I arrived at a home to inspect for animals in the attic. The guys living in the house said that they heard all kinds of walking and scratching in the attic. The first thing I did was an external inspection of the house and roof. I couldn't find any area that animals could use to get inside. Yet when I entered the attic, I saw lot of tracks and tunnels and opossum droppings. I was doing my attic inspection, when I thought I heard a noise coming from down one of the walls. I was able to peek down the wall from the attic, and there was the culprit - a very large opossum was at the bottom of the wall. I wasn't sure if the animal fell down the wall and was stuck, or if it was able to climb up and down. The walls are very smooth, and so I think it'd be very hard to climb up, but wild animals often find a way. I was unable to snare it from the attic, because there was no room. Thus, I went downstairs into the house, and sure enough, one of the guys living in the house told me that he'd heard noises coming from that area. I put my ear to the wall and listened, and felt for warmth coming though the wall, and when I was sure where it was, I cut a hole in the wall about a foot above where the animal was. It was easy pickings at that point, and I used my snare pole to loop it around the neck, and I pulled it out of the wall. One of the customers took this photo of me pulling it out of the wall. The opossum resisted, but I was able to get it out without any problem and stick it in a cage. It was a big sucker! I thought that the job was done when I left the home. However, the guys kept hearing more noises, and so I went back to the home, and saw yet another opossum in the attic. 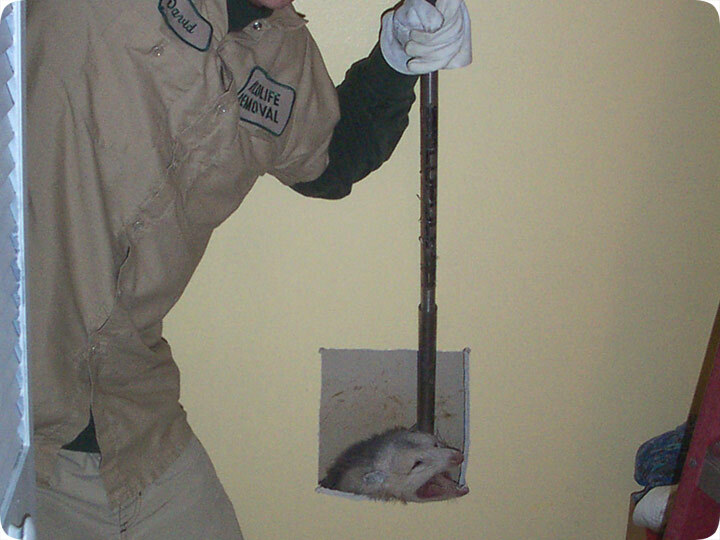 I set some traps in the attic, and over the next week, I removed three more opossums, for a total of four. That surprised me quite a bit. I've never seen more than one adult opossum in an attic at a time. Most of the time its a single female with young. I learned from this that in winter, such as January, adults will congregate in a single place, like a denning behavior. The other interesting thing about this job was that I could not find any way the opossums got into the attic in the first place. After a lot of searching and probing, I eventually discovered that one of the eave gaps lifted up, allowing entry, then fell back into place - much like a door that opens and closes. So the opossums, as a group, opened the door into this attic, one of the animals fell down the wall, and then I removed them. I wonder, if I hadn't, if they'd have gotten stuck in the attic or walls and died. That would have been one hell of a stench!